Nordson ./. GEMA: Claim construction and patentability — which court has it right? Based on Art. 66(2) lit. b PatA in case the court finds infringement there is a substantive entitlement to information and accounting. K16: which is manually operable to initiate a flow of air from the coating material passage (62) in the extension portion (28) through the nozzle (42) to remove coating material from the spray gun (24). 2. What’s it all about? As can be seen in the above illustrations, the attacked embodiment has only one trigger (17) at the front of the handle (the Encore® gun has two triggers there; see above illustration). In normal operation, trigger (17) of the attaecked embodiment triggers the powder flow. 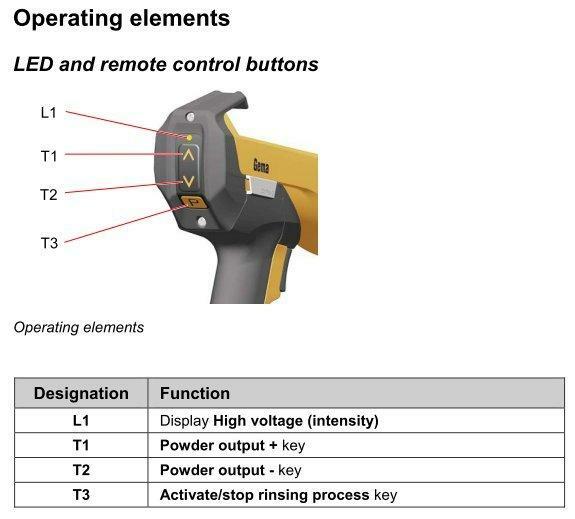 By means of the key T3 on the backside remote control of the gun, functionality of the trigger (17) can be switched to activate / stop the rinsing process. 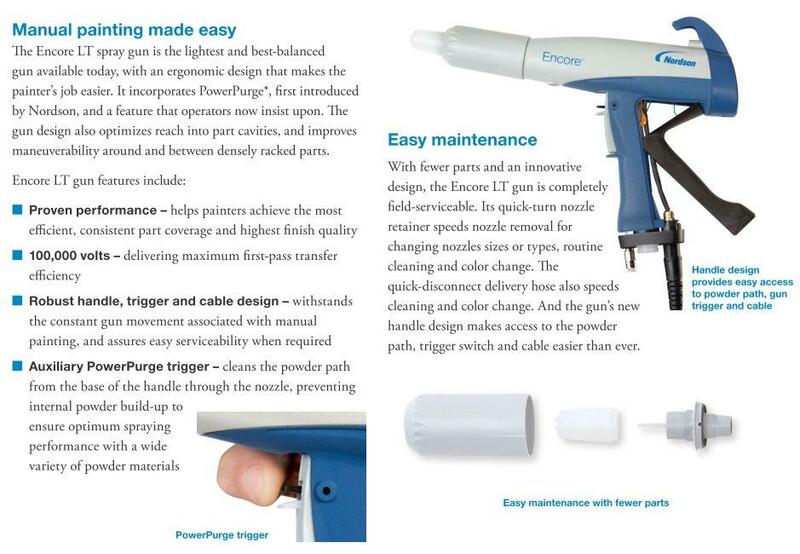 The Encore® gun does not have such a dual functionality of one and the same trigger, but rather has separate triggers for powder and purge air. Essentially, only three claim features were under dispute with respect to claim construction and infringement. 3.1 Are control members (74) and (110) separate elements or not? 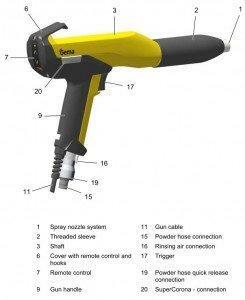 the spray gun (24) also has a purge air flow control member (110). Parties dissented on the question of whether or not the material flow control member (74) and the purge air flow control member (110) are to be distinct elements or whether they could both be embodied by one and the same element. 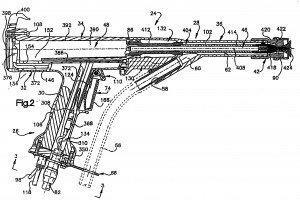 Evidently, in the Encore® gun and in the specific embodiments of the patent, these elements are distinct. The FPC held that both elements may well be realized according to the patent by one and the same element having two functionalities. It is emphasized that embodiments may not be relied on in order to construe the claim in a more limited way than the claims demand for. The general specification and the claims do not mandatorily require that both elements are distinct. The attacked embodiment was thus held to realise feature K14. But what about the “also” in K14, you ask? Interesting point. Note that the Dusseldorf Regional Court had come to a different conclusion; see decision 4b O 25/13. The Dusseldorf court relied on the German term “ausserdem” (see the German version of claim 1 of EP 899 016 B1). The term used in the (original) English language of the patent is “also”, and the FPC thus exclusively relied on the term “also” (in the sense of “auch”). 3.2 What does connected with the handle portion (26) actually mean? Feature K15 requires that the purge air flow control member (110) be connected with the handle portion (26). The FPC held that this wording even allows for an indirect connection of purge air flow control member and handle portion. 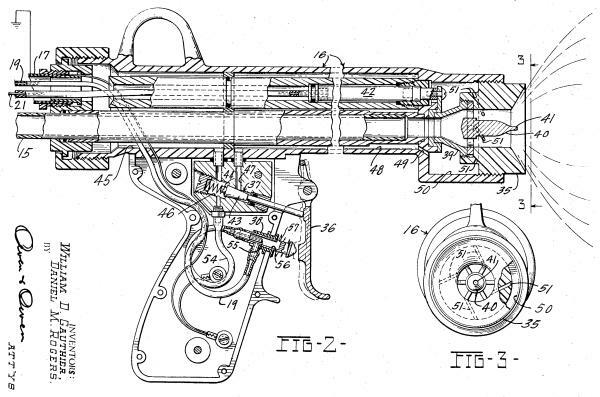 In a function-oriented construction of this feature, the FPC concluded that the connection has to allow for the purge air flow control member being reachable by a user holding the gun at the handle portion. 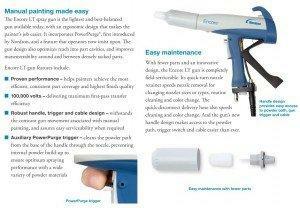 Thus, the purge air flow control member has to be arranged such that a one-handed operation of the gun is enabled. From an illustration in marketing material of the defendant, it is evident that this functionality is realised by the attacked embodiment. 3.3 And what is the meaning of to initiate a flow of air? 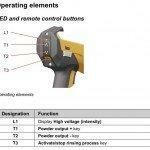 Feature K16 requires that the purge air flow control member (110) be manually operable to initiate a flow of air from the coating material passage (62) in the extension portion (28) through the nozzle (42) to remove coating material from the spray gun (24). It was a matter of dispute whether this covers embodiments where (i) a flow is only initiated if the purge functionality has been unlocked beforehand (by means of another key); or (ii) the flow is not initiated directly, but rather only indirectly by a downstream controller in response to a keystroke on the purge air flow control member. Both situations were held to be covered by this claim feature, and the attacked embodiment was thus held to realise feature K16. The defendant had argued for nullity as a plea in defense. Allegedly, the claimed subject-matter was not novel over D1. However, D1 is silent about the actual location of the purge air flow control element. The FPC thus held that novelty was given, in line with a decision of the Federal Patent Court of Germany in parallel proceedings (see below). Note that D1 is recited as prior art in the patent in suit (see para. of EP 899 016 B1) and had already been considered during EPO prosecution). Defendant also argued that the claimed subject-matter was not novel over D2. 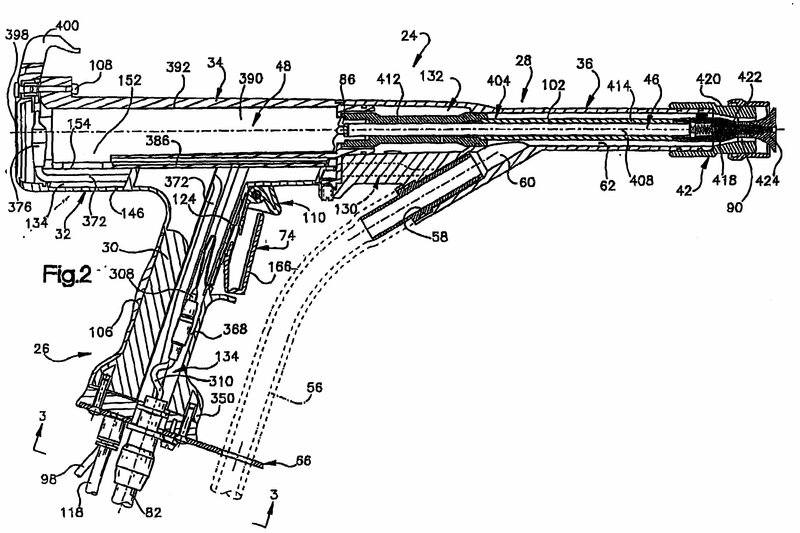 This gun has a trigger (36) that allows for a flow of air to be directed through channels (51) to the nozzle. However, there is no flow of air through the powder path, as essentially required by feature K16. 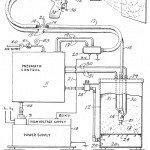 Air in D2 is used to generate a swirl into which the powder is then supplied; the purpose is thus a different one compared to the purge air of the patent in suit. 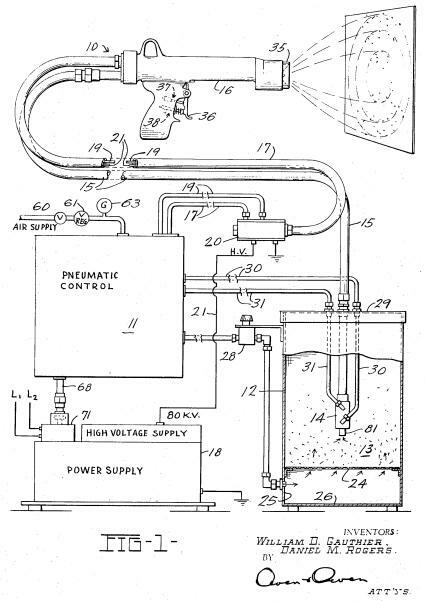 Note that there is disclosure of purge air for the supply channel of the powder in D2, but this one is being operated manually by a valve on a separate control panel (11) on the powder pump, i.e. not on the gun itself. Novelty over D2 was thus acknowledged, too. Again, this is in line with the decision of the Federal Patent Court of Germany in parallel proceedings (see below). Ein derart häufig und darüber hinaus auch noch leicht zu aktivierender Spülluftstrom vermittelt dem Fachmann jedoch, dass das Spülluftstromregelungselement in seiner unmittelbaren Nähe positioniert sein muss und demzufolge nicht entfernt von der Spritzpistole platziert sein kann, da er die Steuerung der Spülluft zudem individuell und somit manuell vornehmen wird. Da die D1 selbst keine Angaben macht, wo ein derartiges Regelungselement angebracht ist, positioniert der Fachmann dieses in unmittelbarer Nähe des Bedieners, wobei die Spritzpistole selbst als Ort der Positionierung am nächstliegenden erscheint. The FPC held that the German court erred and had based its conclusion on an undue ex-post-facto analysis: D1 is silent about a location in close proximity, and a remote location is not indictated as disadvantageous. Moreover, not even a manual operation / initiation is mentioned in D1. Finally, the combination of D1 with D3 failed mainly because D3 does not concern a powder spray gun, but rather a hydraulic spray gun for liquid substances. 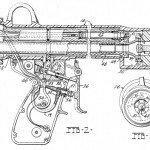 Again, the German Federal Patent Court concluded differently. However, the German court obviously relied on a further document D30 (see p. 22, last paragraph) in addition to D3, but this document was not put on file in the Swiss proceedings, for whatever reason. Further prior art documents D4, D5 and D6 relate to applicators for more-component reactive compositions instead of powder coatings. The FPC thus held that the person skilled in the art would not even consider these documents. Die Einrede des freien Stands der Technik könnte ohnehin nur zum Zug kommen, wenn nicht eine wortsinngemässe Patentverletzung, sondern Äquivalenz zu beurteilen ist. This is what the headnote is all about. As outlined above, validity and infringment of the patent had been established, but the plaintiff had not provided further reasoning or evidence with respect to the financial compensation sought for in this action by stages. In a nutshell, the defendant argued that only the quantification is deferred to the second stage of the proceedings, but not the whole burden of proof as to the further legal requirements for financial compensation. For instance, the plaintiff had not presented any allegations as to the bad faith of the defendant — a requirement for recovery of defendant’s profits. With respect to damages for lost profits, the plaintiff had neither argued nor substantiated that he makes any profits with products according to the patent. The FPC held that the defendant’s substantive duty of disclosure and accounting is directly based on Art. 66 lit. b PatA since an infringement had been established. At the first stage of the proceedings, the plaintiff is not obliged to establish the further legal requirements for recovery of defendant’s profits, or damages. The value in dispute was CHF 2.6 m, and the parties apparently put an enormeous effort into it. 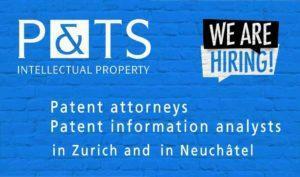 Compensation for legal representation in the amount of CHF 80’000,– was awarded to the plaintiff, according to Art. 3 ff. CostR-PatC. Noteworthy, costs awarded for the patent attorney were even higher, i.e. CHF 114’185,64. An apparatus (20) for use in applying powder coating material to an object comprising a spray gun (24) having a handle portion (26), an extension portion (28) which is connected with the handle portion (26), a nozzle (42) connected with the extension portion (28), an electrode (46) disposed adjacent to the nozzle (42) and away from which electrostatically charged coating material flows toward the object, a coating material flow control member (74) connected with the handle portion (26) and manually operable to an actuated condition to initiate a flow of coating material from a coating material passage (62) in said extension portion (28) through the nozzle (42) toward the object, characterised in that and a coating material passage (62) in said extension portion (28), characterised in that the apparatus has a valve (94), a conduit (98) and a controller (70) which, simultaneously with opening of a valve (54) and closing of a switch (78), operates the valve (94) to an open condition to enable electrode wash air under pressure from a source (96) of electrode wash air to flow through the conduit (98) to the handle portion (26) and from the handle portion (26) of the spray gun (24) through the extension portion (28) of the spray gun (24), the spray gun (24) also has a purge air flow control member (110) connected with the handle portion (26) and which is manually operable to initiate a flow of air from the coating material passage (62) in the extension portion (28) through the nozzle (42) to remove coating material from the spray gun (24). These amendments in the German proceedings were not based on dependent claims; the added features were taken from the description. In infringement proceedings, the Düsseldorf Regional court decided for non-infringement of the patent as granted, neither literally nor under the doctrine of equivalents; see decision 4b O 25/13. The decision has been appealed to the Supreme Court. A decision can be expected by mid 2016. 3.1 puzzles me. 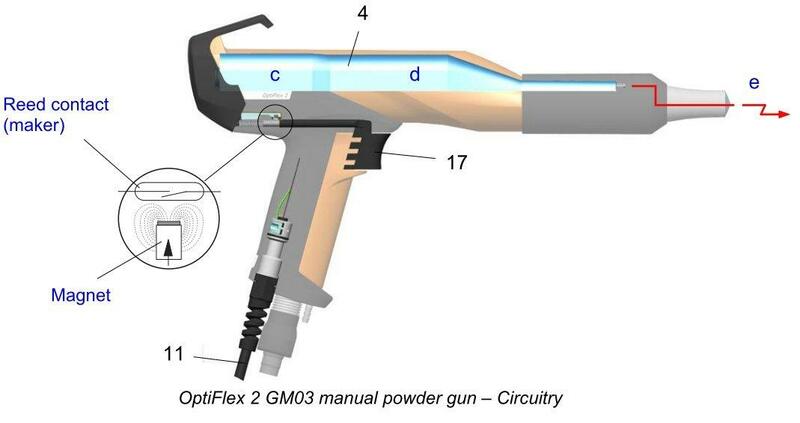 of the patent says there is a coating material flow control member disposed on the handle. 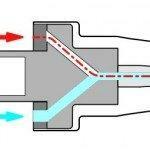 Then,  goes on to say that an air flow control member is also disposed on the handle. It clearly talks about two members with different names. In my perception, a member is a physical entity, and when it discusses two of them, then one would reasonsbly expect two entities. Else, if one and the same member could do both jobs, the patent should have talked e.g. 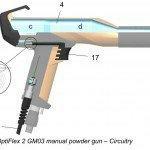 about an air flow control functionality and a coating material flow control functionality on the handle. According to the FPC’s website, the appeal has been dismissed with an order of November 11, 2015 (“Verfügung Bundesgericht vom 11.11.2015, 4A_522/2015; Beschwerde abgeschrieben”). No publication is yet available on the Supreme Court’s website. Meanwhile, the order of the Supreme Court is published (4A_522/2015). The parties have settled the matter out of court. 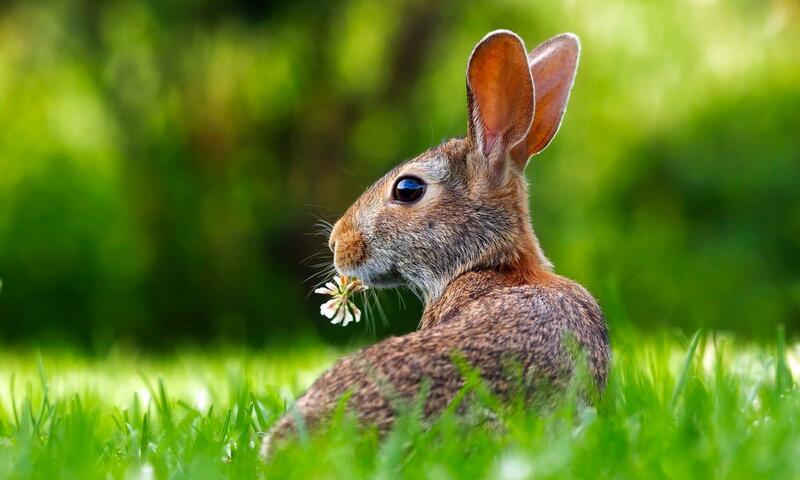 Apparently, the plaintiff has withdrawn his suit as part of the settlement, and the matter has now been referred back to the FPC for a decision on costs.